So the instruction part of our Citizen Schools apprenticeship has come to an end. Tomorrow evening at MIT we are holding an event for some of the technology apprenticeships across the city. Our students will get to demonstrate their games and explain basic concepts via some posters that they created last week. The last few classes have been quite good, except for the week before spring break when only four students showed up. We enjoyed giving a lot of attention to the students who did show up, but we had to catch everyone else up over the next few weeks. The key thing that Lee and I have found very effective (suggested by Emmanuel) is trying to maintain a good deal of structure within the lessons, giving them one small milestone at a time rather than open-ended tasks. There have been a lot of opportunities for the students to work on their games, and for the most part they have been more engaged than at the beginning of the class. 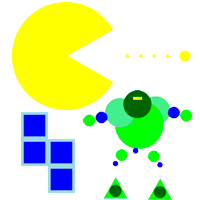 Instead of covering function definitions and boolean logic, they’ve had fun drawing character graphics (using rectangles, circles, and triangles as primitives), moving characters around, and implementing collision detection. Of course we’ve had the occasional straggler who isn’t at all interested in exploring what can be done given their game framework, but overall things have been very positive. Students have been excitedly showing each other what they’ve done. One thing that amuses me to no end: We have two students who we’ve assigned to work together. They have been paired together just about every week that they attend class. But without fail when they walk into the room and see their notebooks together, each will try to move to another workstation, and they complain (pretty loudly) about not wanting to work together. This is not all that surprising considering that most of our other partnerships don’t exactly demonstrate good teamwork; partners regularly antagonize each other. The thing about these guys, though, is that once they get down to work they actually help each other, looking over what’s being typed, making suggestions, and answering each other’s questions. It’s really great to see.